President Buhari refuses to sign 2016 budget | your dependable source for the latest news, music & general information. Major national dailies for today, March 30 focused their reportage on the fresh issue restraining President Muhammadu Buhari from appending his signature on the long awaited 2016 appropriation bill, as well as Ibe Kachikwu’s reaction to the untold hardship Nigerians have been subjected to following the protracted scarcity of petroleum products. Nigerian Tribune in its report says President Muhammadu Buhari on March 29 refused to sign the 2016 appropriation bill into law. Top presidency source privy to the development told state house correspondent that the president declined to append his signature to the document, because it was discovered that it was a mere highlights rather than the entire document. 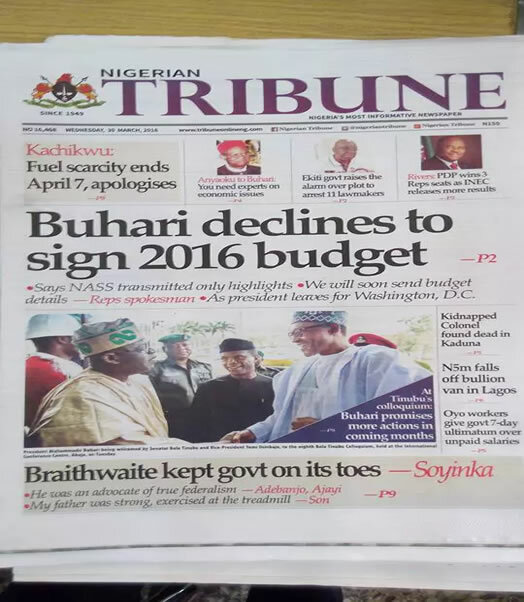 Share on Facebook Share on Twitter Nigerian Tribune newspaper The source said the National Assembly may have not completed work on the budget, but merely playing politics with the document and accused the lawmakers of sabotage. “This development confirms speculations that the National Assembly either did not complete work on the budget or is playing politics with the documents which affects the life of both the country and its citizens. The National Assembly may just have passed the bill to pass the buck to the executive and escape the wrath of the public, which was gradually suspecting it of sabotage,” the source revealed. According to The Guardian, the two chambers of the National Assembly passed the budget last week after about three months. The Senate passed its version on Wednesday last week, the House of Representatives passed its own version on Friday, but it could not be ascertained on Tuesday, if the conference committees of both chambers responsible for reconciling the two versions of the bill had met to harmonise it. 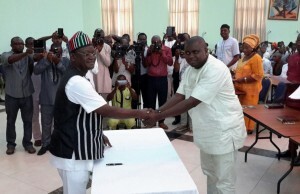 Pointers from the presidency indicate that the signing of the document might suffer some delays because of the ambiguity in the way the document was handled by the lawmakers. The delay may take longer than expected as the president would soon jet out of the country to the United States to attend a nuclear summit alongside other world leaders. Share on Facebook Share on Twitter The Guardian newspaper Another presidential source said: “As a result, the president has been handicapped in signing the bill because he does not know what is contained in the dletails and what adjustments the National Assembly must have made to the proposal sent to them. Although he is anxious to sign the document so that implementation could start immediately and ease the tension in the economy and polity, he is afraid he may later discover, when the details are sent, that what is contained therein is not implementable. He wishes the National Assembly could send in the details speedily so that it could be considered for assent.” This Day reports that the president is awaiting the submission of the detailed budget from the lawmakers, before it can be dispatched to all the ministries, departments and agencies (MDAs) of government for review to ascertain any significant amendments carried out by the legislature. The aim of the review is to verify if any of the amendments by the legislature are inconsistent with the spending plan of the executive, thus rendering it unimplementable. Share on Facebook Share on Twitter This Day newspaper It was gathered that ‎ministers are also eager for the quick signing of the budget to enable them commence implementation of their programmes, but the ministers have agreed with the president that the bill can only be signed into law when the details have been transmitted to him. The ministers are also anxious that the year is gradually advancing and the provision of the law in respect to spending from the previous year’s budget is not helping matters because of the low capital provision in 2015 budget. The Punch reports that Dr. Ibe Kachikwu, the minister of state for petroleum was on March 29 summoned by the Senate committee on petroleum resources (downstream) to explain the cause of the recent fuel scarcity across the country and the efforts being made by his ministry to halt the embarrassing situation. Share on Facebook Share on Twitter The Punch newspaper The minister during the briefing lamented the development and apologised to Nigerians, who he admitted were facing difficult situation. He promised that the scarcity would end on or before April 7. Daily Sun reports that following the untold hardship faced by Nigerians against the backdrop of the recent fuel scarcity, Kachikwu has maintained that he would not resign as minister over his inability to resolve the situation. The minister assured that he still has a lot to offer Nigerians and will therefore not succumb to calls for his resignation. He used the opportunity to lash out at his critics, over his comments that he was not a magician who could end fuel scarcity overnight. Share on Facebook Share on Twitter Daily Sun newspaper Kachikwu, who insisted that he shared the pains of Nigerians, reiterated that he worked all day to monitor the supply of fuel with a view to ensuring that the challenge is brought to an end. He said he had continued to work with one sole purpose which is that every problem must have a solution and as such, the problem of the petroleum industry would be defeated. “I do apologize for the comment that I made jokingly with my friends in the press about being a magician and it offended Nigerians. It was not meant to be, it was a side jocular issue. “I did go on to explain what needed to be done, I did not know that it would create the kind of hyperbole that it did. Let me first admit that I am not a typically experienced politician, I am a technocrat. I came to work. “Some of the phrases that I may use, while being acceptable in the arena in which I play, obviously will not be acceptable in the public political arena. So, if anybody’s sensibilities were offended by those, I totally apologize,” Kachikwu said.